Everyone on their way to Niagara Falls knows the iconic places to snap a good picture of Horseshoe Falls. In the high season, Queen Victoria Park, which stretches through the tourist area of the Canadian Side, is packed shoulder-to-shoulder with visitors craning for a good view of the falls; boat tours like Maid of the Mist and Hornblower have been booked solid for months; and exciting locations like Skylon Tower and the Skywheel boast long lines for entry. If all you’re after on your vacation is a lowkey look at the falls’ majesty, you are going to need to find someplace unique — someplace hidden. Fortunately, spots like that exist. In fact, there are several secret scenic spots around Niagara Falls, so you can enjoy the power and glory of the natural wonder in peace. You could buy tickets to reach the top of Skylon Tower to see stretching views of the entire Niagara region. You could buy tickets to circle around the SkyWheel, getting glimpses of Niagara Falls from above. Or, you might want to enjoy scenic Niagara vistas from the quiet comfort of your hotel room. The Crowne Plaza Niagara Falls was built in the 1920s to provide glamorous and elegant accommodation to tourists visiting the falls. Back then, it was among the first hotels in the skyline to offer four-star luxury and unparalleled views of Niagara. Today, it remains the standard of sophisticated Niagara travel while still catering to families and budget travelers. Importantly, it isn’t just the unattainable, high-priced suites that provide jaw-dropping views of the falls and beyond; at the Crowne, you can watch the falls through your window without breaking the bank. Plus, the Crowne offers other unbeatable amenities, as well. In the lobby, you can enjoy some of Niagara’s best shopping experiences, including a trip to Hershey’s Chocolate World and a handful of top-tier gift shops. Furthermore, there are comfortable, indoor connections to Niagara Falls’ most exciting attractions, including Casino Niagara and Fallsview Indoor Water Park — which provides another exhilarating view of the falls. Connecting the American and Canadian sides, the Niagara Falls International Rainbow Bridge is just downriver from the action — ensuring you get amazing views without competing for space like you would in Queen Victoria Park or other popular viewing spots closer to the falls. From the bridge, you can see both the American and Canadian falls, as well as much of the Canadian skyline. Most tourists drive across the bridge without a second glance at the views, so for just $.50, pedestrians and cyclists can enjoy reaching panoramas of Niagara Falls and the Niagara River without a hassle. The Rainbow Bridge wasn’t the first bridge to cross the Niagara Gorge. Preceding it was the Honeymoon Bridge, built in the 1890s, which in its time was the largest steel arch bridge in the world. Unfortunately, the Honeymoon Bridge collapsed after a terrible winter storm in the 1930s. The Rainbow Bridge was constructed nearby just a few years later, stronger and safer, though just as beloved as its precursor. Another reason to take trip to the Rainbow Bridge is to give you time exploring the Niagara Gorge on the American side of the falls. Though the American side is less amenity- and attraction-filled than the Canadian side, its vast natural spaces provide solitude and space to enjoy the splendor of the area. The Niagara Gorge boasts several walking and hiking trails that lead to scenic overlooks of the falls and surrounding country. 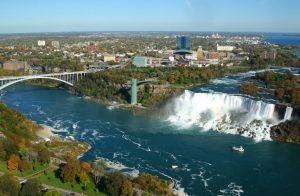 The Niagara Gorge Rim Trail will lead you up close to the American and Canadian falls, but you might also want to spend time on the American Falls Gorge Trail or any of the trails that take you past Niagara River’s white-water rapids. You should know by the power of Niagara Falls that Niagara River is no lazy waterway. In fact, just downriver from the falls are Class VI rapids and a dangerous whirlpool. If you’d rather not cross the border, you can see both the rapids and the whirlpool from the Niagara Glen Nature Reserve on the Canadian side — where you can also take a scenic and exhilarating trip in the high-flying Whirlpool Aero Car. The Rainbow Room by Massimo Capra. The high-class in-house dining at the Crowne Plaza, the Rainbow Room offers a panoramic view of the falls and surrounding landscape. Windows by Jaime Kennedy. Similarly, Windows is the in-house restaurant for sister hotel Falls Avenue Resort. Focusing on incorporating local fare into its food, this restaurant looks and tastes like Niagara Falls. Canyon Creek Chophouse. Perhaps the biggest secret view of Niagara Falls, the Chophouse is slightly removed from the river but still offers outstanding food and atmosphere.